Orbits of the fifth and sixth Galileo satellites launched together on August 22, 2014, in red, compared to their intended position, in dashed green, and the position of the four IOV satellites launched in 2011 and 2012 in solid green. This view looks down over Earth’s South Pole, helping to illustrate how the two satellites’ orbital inclination relative to the equator is less than was intended ESA illustration. The European Space Agency (ESA) released dramatic illustrations today (September 16, 2014) of the orbital locations of the two errant Galileo spacecraft launched on August 22, the intended orbit, and the locations of four In-Orbit Validation (IOV) satellites. According to ESA, the fifth and sixth Galileo satellites have been in a “safe state” since August 28, fully under control of ESA’s space operations center in Darmstadt, Germany, despite having been released into lower and elliptical orbits instead of the expected circular orbits. The potential of exploiting the satellites to maximum advantage, despite their unplanned injection orbits and within the limited propulsion capabilities, is being investigated. Marco Falcone, ESA’s Galileo system manager, speaking at an Institute of Navigation GNSS+ 2014 conference last week, said ESA will attempt to save the first fully operational capability (FOC) Galileo satellites placed into the wrong orbits as a result of the launch mishap. “It is our intention to rescue this mission,” Falcone said. The spacecraft were placed into a highly elliptical orbit — ranging from a maximum altitude (apogee) of around 25,900 kilometers and a minimum altitude (perigee) of around 13,700 kilometers — and an incorrect plane more than 3,000 kilometers off target. The intended orbit would have been circular, inclined at 55 degrees to the equator at an altitude of 23,222 kilometers. Falcone said his team has been working intensely to determine if the satellites, which are otherwise healthy, can be at least partially recovered. Among the considerations are the flight dynamics of moving the two spacecraft and the impact of the radiation they are experiencing in their current location. Other factors include flight dynamics and optimal re-orbiting and in-plane phasing given the limited propellant fuel on the spacecraft. ESA engineers are looking at expected user and ground receiver performance in light of the varying Doppler effects at perigee and apogee. Another unknown is the timing performance of the satellites’ rubidium frequency and hydrogen maser given the relativistic effects of the eccentric orbit. Signal issues, such as the navigation message almanac, also must be considered before the FOC satellites can be introduced into operation, Falcone said. 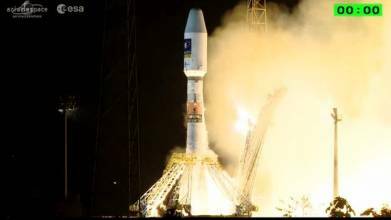 An independent board of inquiry began work on August 28 to investigate the problem, which stems from the Russian Soyuz launcher and Fregat upper stage used to place the satellites in orbit. Both spacecraft are safe and in stable conditions with their solar array wings deployed and pointing in the correct direction toward the sun, Falcone said. All equipment on board the satellites appear to be in healthy condition, although — as planned for this stage of operations — the navigation payload is not transmitting. A determination on how to handle future launches will depend on what the investigation finds, Falcone said, but he told Inside GNSS that a backup plan was not currently in place to change launch providers. A Soyuz rocket is currently scheduled to launch the next two FOCs, followed by four-satellite missions using Ariane 5 launchers. He also told attendees that the program was investigating problems with the fourth Galileo satellite — an IOV space vehicle that developed problems earlier this year. The signal on GSAT0104 has been unavailable since May 27 and will remain so until further notice. Some of the signals on the other three IOV satellites have been experiencing problems as well; so, ESA has “backed off” the power on a number of signals from the other IOVs as well. ESA specialists, supported by industry and France’s CNES space agency, are analyzing various scenarios that would yield maximum value for the program and safeguard, as much as possible, the original mission objectives, ESA said. More detailed analysis, alongside consultations with industry, is under way, checking for a potential “improved orbit” where they could both provide operational services. Despite the glitches the program is effectively fully funded through 2020 and already planning for the future with the support of €400 million allocated for research into advanced technology such as inter-satellite links and electric propulsion. The third and fourth FOC satellites are already at ESA’s technical center in Noordwijk, The Netherlands, undergoing tests and another 18 are in various stages of assembly at OHB System in Bremen, Germany. The satellites are being made ready for launch as soon as Soyuz anomaly investigation is completed. Falcone said that the Galileo space segment deployment will proceed based on Soyuz/Ariane5 launch capability. The current schedule for Galileo FOC launches calls for having 26 satellites (counting IOVs) in orbit by 2016/2017.